I was too awe-struck with the beauty of cherry blossoms during my first trip in Tokyo. Sadly this meant foregoing my plans to visit Akihabara, Tokyo’s mecca for electronics and for anything “only in Japan”, in exchange for more time to enjoy hanami picnics under the lovely cherry blossom trees. So when I returned to Tokyo to attend a travel conference this May, I did not let my second chance to visit Akihabara to just slip by! I have to admit that I am intimidated with my own plan to see Akihabara despite being a seasoned traveler. I’m not really a fan of anime which Akihabara is well known for but felt a very strong urge to experience the bizarre side of Japan. After a quick google search, I stumbled across a reasonably priced 3-hour guided tour of Akihabara. Booking a guided tour is not so me! But I realized that it makes a lot of sense to have a local travel-expert guide you through a place like Akihabara. Without the guide, I could have missed 90% of “only in Japan” experiences had I toured around the place on my own. The best weird experiences can be found on top floors of buildings and can hardly be found by someone who doesn’t know how to read Japanese. 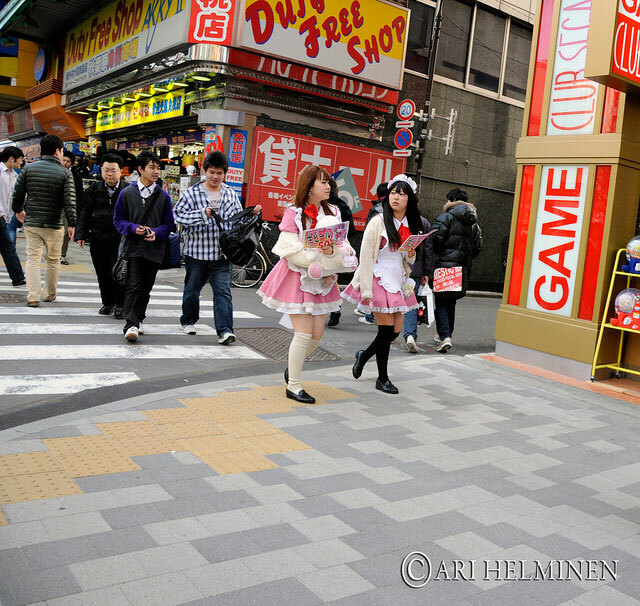 So if you are looking for “only in Japan” experiences, Akihabara is the place to be. But to make your experience more interesting and meaningful, I strongly suggest for you to bring a local Japanese friend with you or book a tour with a local Akihabara expert. So I met with the Akihabara tour expert on a bright Sunday morning right outside Gundam Cafe. It was a beautiful cloudless spring day and the aircon weather was just perfect for a 3 hour walking tour. I was 30 minutes earlier than our scheduled meet up and enjoyed people-watching right outside Gundam Cafe as the legion of anime fans slowly flooded the streets. At 11 am, Gamme-san, our Akihabara tour expert, emerged from the crowd and I just knew it was her. What a weird feeling! 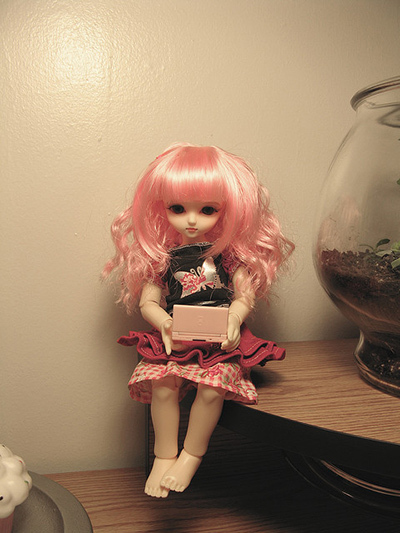 She’s very engaging, cheerful, spoke good English and she is someone who deeply knows the ins and outs of Akihabara. I initialy thought that the 3-hour walking tour was too long. I was wrong! 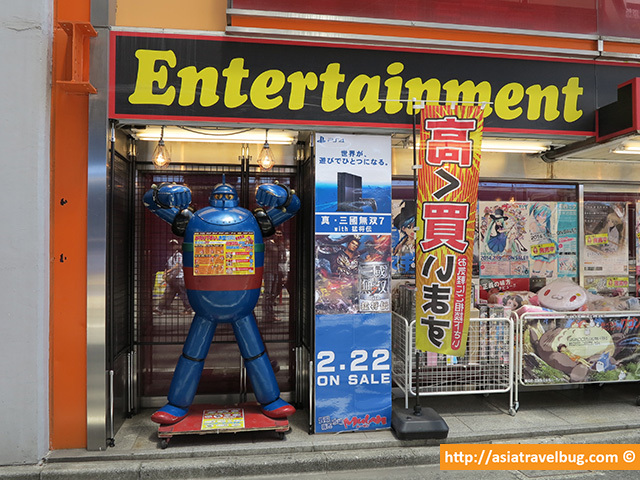 I extremely enjoyed the experience exploring robotic and game shops inside the maze of Akihabara buildings. The 3 hours flew by so quickly! Gamme-san went beyond what is expected from her tailoring fit the tour to my interests as a non-anime fan. She also extended the tour for another 30 minutes just to show the shops where local Japanese delicacies can be purchased at prices cheaper than supermarkets. So let me tell you my top 10 favorite “Only in Japan” experiences in Akihabara which I hope you would get to experience too when you are in Tokyo. 1. Robotic dogs are way much cheaper than real dogs. Now I understand why robotic dogs are popular in Japan. You will be surprised to know that it is possible for these robotic dogs to cost less than half the price of a real dog! 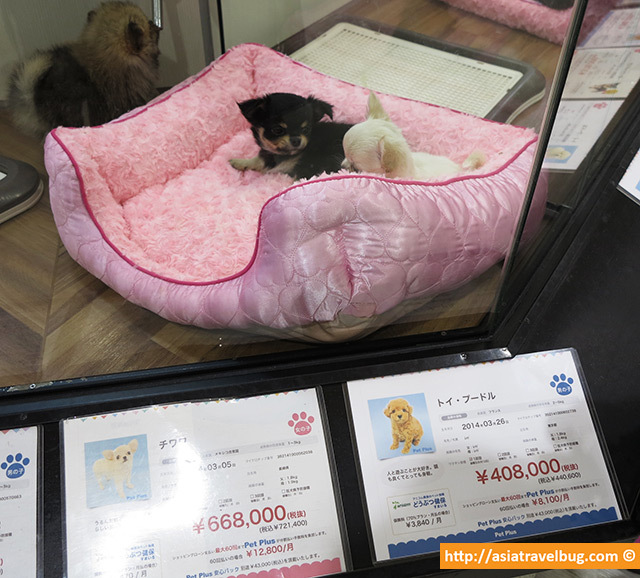 I chanced upon a pet store in Odaiba on a separate occasion and realized that owning a pet in Tokyo is not easy. The adorable puppies in the pet store can cost as high as USD 6000+ each. 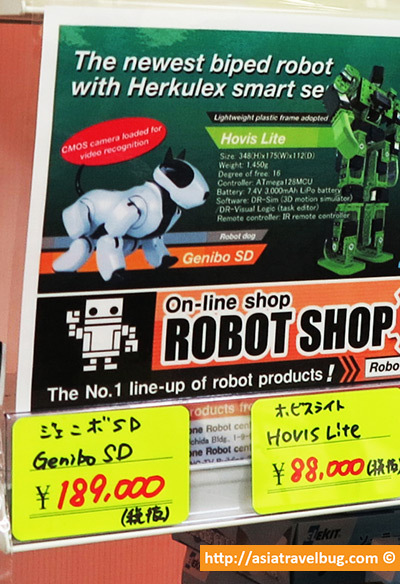 Interestingly, robotic dogs available for sale in robot shops in Akihabara cost only less than USD 2000! 2. 2-decade-old family computer games are still being sold in stores. 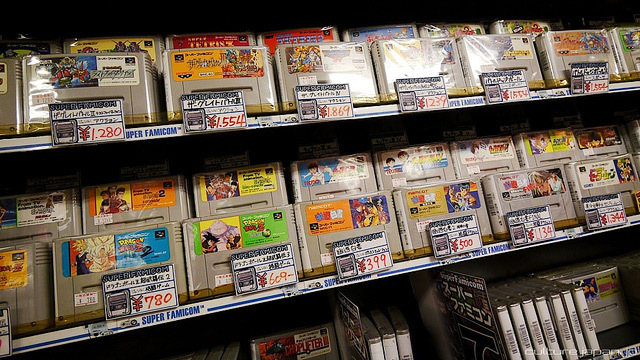 Gamme-san took me to retro game store and I loved every moment of it! It is good to reminisce childhood memories once in a while. So happy to see Super Mario and other 1990s games to remain on store shelves. I will be very amazed if these 2-decade-old games are still in good working condition. But who knows? Things made in Japan are meant to last really really long! 3. 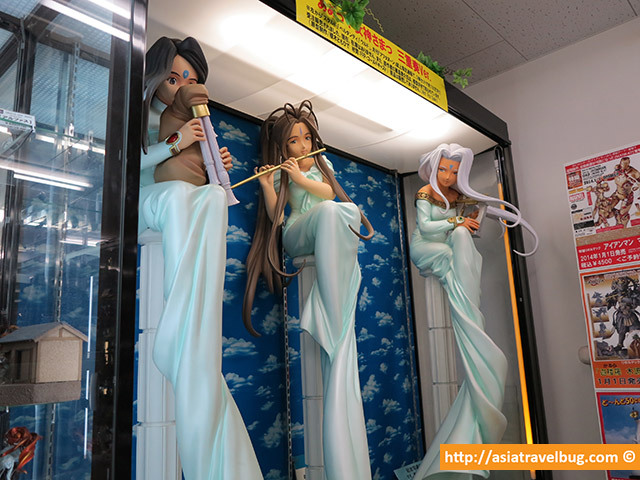 Find life-size anime figures priced at USD10,000. Yes, you read it right. Each of these life-size figurines cost a whopping USD10,000! What’s more surprising is that all of these three figurines have been sold out. 4. Eye glasses, watches and pens are beyond ordinary. 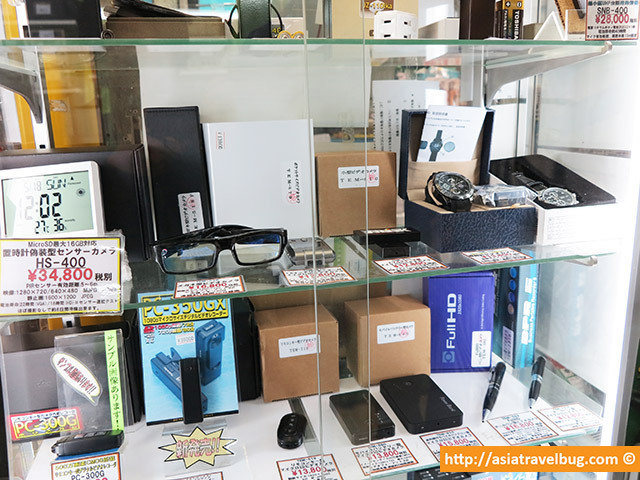 There is no doubt that all kinds of electronics can be found in Akihabara, including these unassuming detective gadgets! 5. People shell out $$$ to dine and be called “masters” in a maid cafe. I didn’t get a chance to get into a Maid Cafe but was able to take a little peek on what’s happening inside. It’s somewhat bizarre. Food and drinks are served in bright fancy dinner wares with servers in maid costumes. Imagine it like the tea party scene in Alice in Wonderland. And no, the Maid Cafe patrons are not kids. 6. Locals are very much obsessed with AKB48. 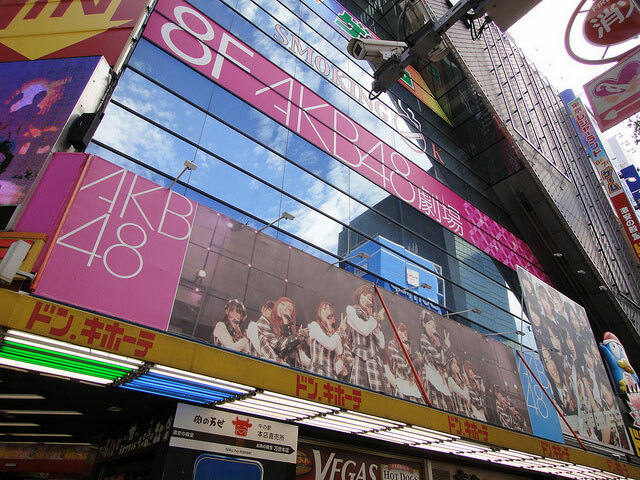 AKB48 is the most popular girl group in Japan so do not be surprised to find AK48 signs and banners everywhere. 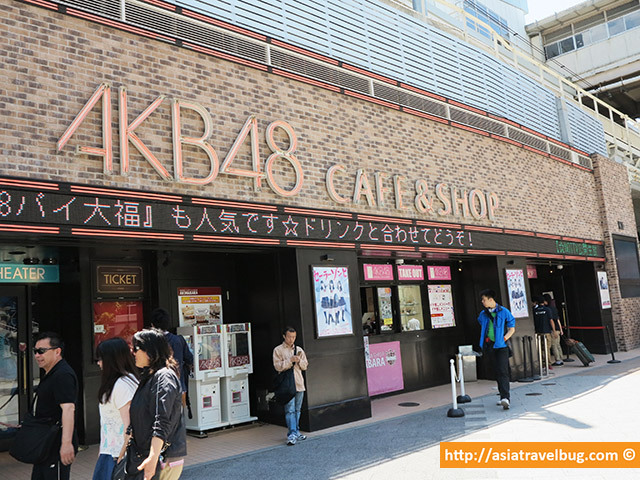 The 48 member girl band originated from Akihabara, hence their name of AKB48. 7. Retro stuff meets modern world. I am not sure if these are first generation computers. Some are just too retro for me to identify what these equipments are. 8. Men shop for barbie-like dolls. 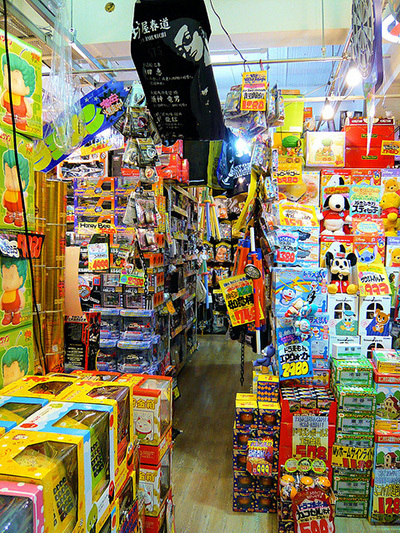 Fashion designers frequently shop in Akihabara’s doll stores to find materials to create clothing design prototypes. But most of the shoppers in these doll stores are men. There could be another reason but I will have to leave that to your own imagination! 9. Find Don Quijote in the middle of Akihabara, the disorganized shop in an orderly-obsessed Japan. Despite of the messy store layout, do not under estimate Don Quijote! I think it is one of the best shops in Tokyo to look for discounted stuffs. From green tea kitkats to second hand Louis Vuitton bags – all can be found under one roof in the Don Quijote mega store. 10. Radio halls do not sell radio. 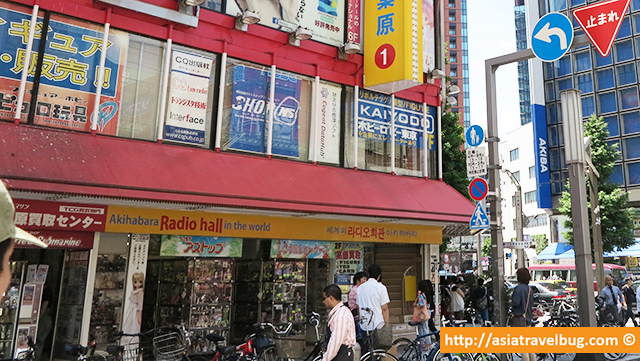 You will quickly notice that majority of the stores in Akihabara have “Radio hall” in their shop name. However, it is ironic that most of these shops do not sell any radio anymore. 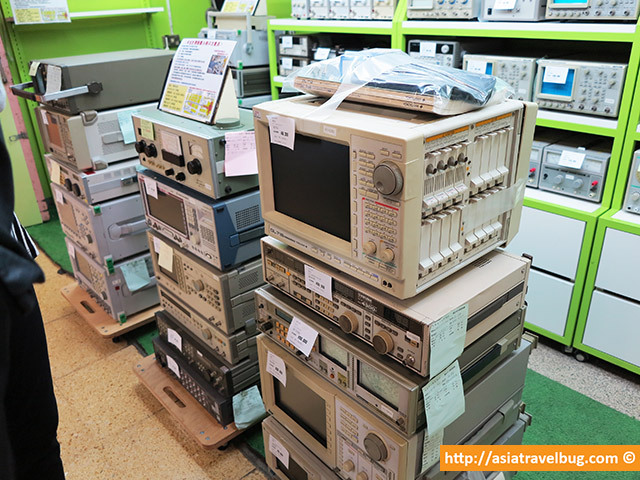 The area of Akihabara has a rich history dating back in the 1940s when radio electronic part shops were put up during the time when radio was the most advanced technology available. So do not let the shop names in Akihabara fool you. Yes, I would recommend this tour for people who would want to experience the bizarre side of Japan or for people who are obsessed with anime! For the cost of USD30, I think I got more than the tour’s value and had a lot of priceless unique moments which I could not have experienced had I explored Akihabara on my own. If you want to experience this 3-hour tour, you can book the Deep Akihabara Tour from GoVoyagin.com here. Voyagin is a marketplace where you can discover and book over 1000 unique, authentic travel experiences in Asia. If you love this article and wish to receive future Japan travel tips from Asiatravelbug, like us on Facebook and follow us on Twitter! 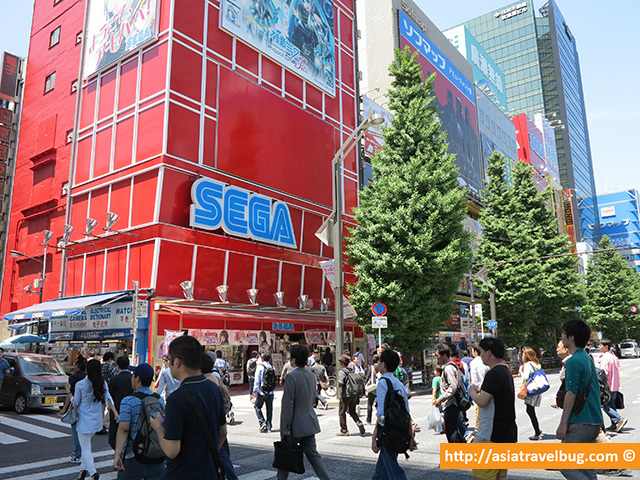 Disclosure: I was given USD 10 rebate by Voyagin where I booked the Deep Akihabara Tour of Gamme-san. However, all opinions on this blog are my own. What is a must do for 2 american teenage girls that is unique and different. Although there are some sights in Akihabara that are for adult only, it doesn’t mean that the entire Akihabara is not recommended for teenagers. 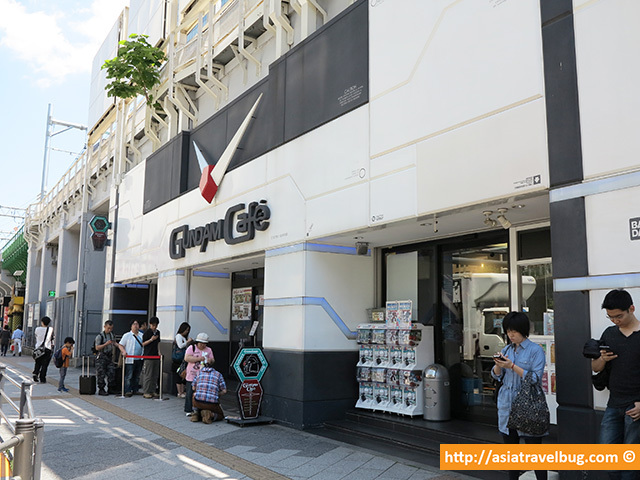 There are a lot of fun things to do in Akihabara including visits to maid cafe, arcades and specialty shops specializing in collectible items. You can actually tell your tour guide in advance in the 3-hour Akihabara tour what you want and what you don’t want to see during the tour. Welcome back to my blog! The location of Akihabara is actually very strategic and you can reach tourist areas within less than 30 minute train ride radius (i.e. Ginza, Tsukiji, Shinjuku, Shibuya). Also, there are plenty of shops and restaurants around but more into electronics and Otaku/geek theme, with some shops bordering really bizarre and for adult. I suggest Akihabara for adults. There is only a small variety of hotels in Akihabara. If you wish to stay here, you may want to try Remm Akihabara Hotel which is located just above Akihabara Station. As first time travelers to Tokyo and if you want to have a similar feel to Dotonbori in Osaka, I suggest your family to stay either in Shinjuku or Shibuya where small restaurants and shops are plenty. Akihabara is highly accessible via train anyway. Please feel free to check out my recommended hotels in my Where to Stay in Tokyo blog. Thanks Char for sharing your tips about Kumamoto! Looks like a very interesting place in Kyushu! Your tips will really be helpful for the other readers here. I love shopping in Don Quijote. I think it is Japan’s best kept secret for bargain shopping. The huge Gundam statue has never been in Akihabara, it’s located in Odaiba. Nice article and sheds light on more interesting things to do in Japan. Thanks Jag for taking notice! Done with correction. 🙂 I am very happy that you found this article useful. Hi Siti, I believe the huge Gundam statue that you’re looking for is now at Odaiba in front of Diver city (shopping mall). Because tht gundam statue are not in akiba..its in Odaiba..